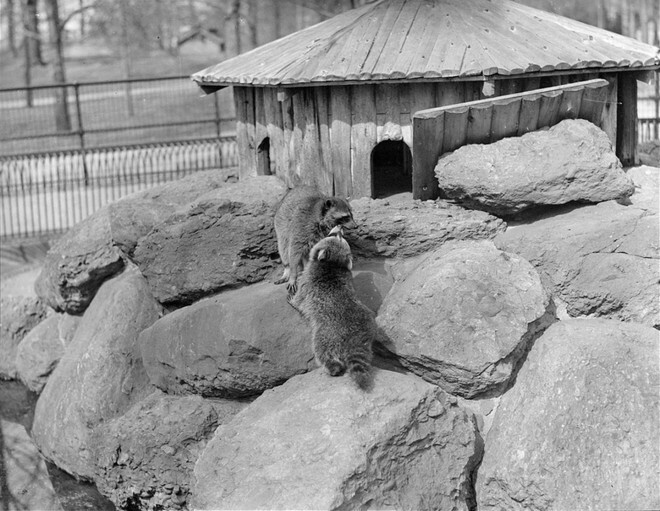 The Raccoon Cage in Franklin Park, Boston. Image from the Boston Public Library, via Flickr. 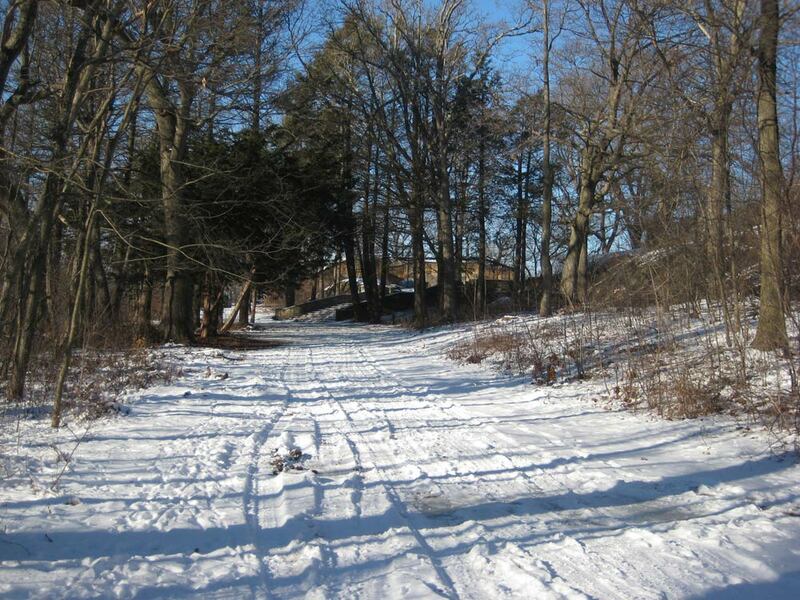 The pedometer recorded 4.88 miles for the day, and the thermometer said 24ºF. 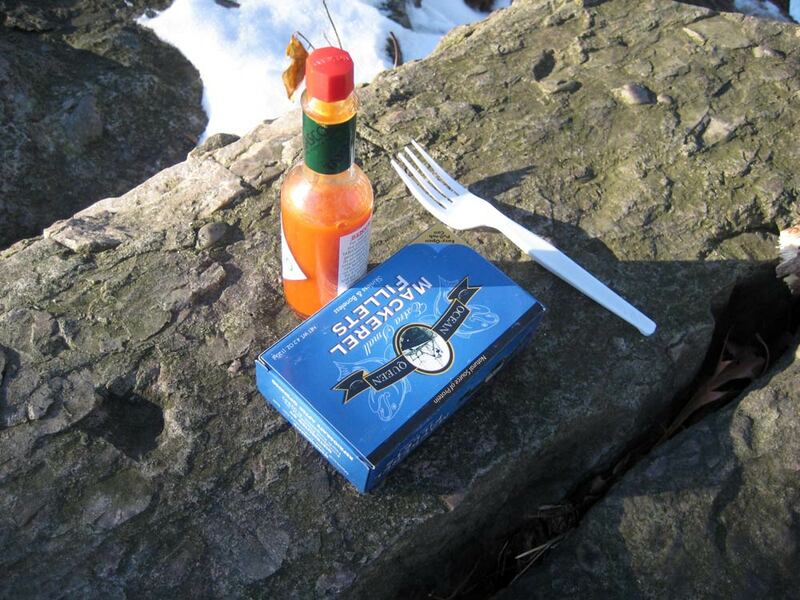 Luckily, I’m always prepared. I had not planned on writing today about my wanderings in Franklin Park, because I still have a lot of work ahead of me and I want to post a second introductory text before getting into the details of the various sites and ruins, and my thoughts on their relevance. Yet, today as I was out photographing, I had one of those novel moments that made me want to type – I’m too excited by this new ruin to wait. For the past 4 months I have filmed and photographed all of the sites I can find in the park that are on the original Olmsted plan, and intend to re-visit them (except those in the Zoo) at least once a month for a full year. 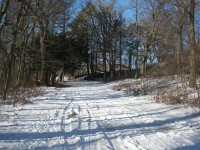 So today, on a sunny but cold January day, I set out for my 5-mile walk. With the golf course closed and the layer of snow only an inch or two, I was able to get a lot of views normally off-limits. I don’t mind golfers yelling at me, but they sometimes hit balls in my direction which is annoying. By the end of autumn the park rangers were following me from time to time, probably worried about the weird guy with the camera bag who would randomly disappear into the woods and emerge, covered in dried leaves and dirt, someplace unexpected. 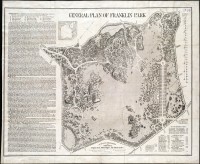 A map of Franklin Park. Long Crouch Woods is in the upper-right corner. All of this is to say, in more words than necessary, that I thought I had found all there was to find in Franklin Park. Upcoming writing on this website will discuss my process in detail, including some mysteries I am trying to solve, but otherwise I have been feeling confident that I had pointed my camera at all there was to see. 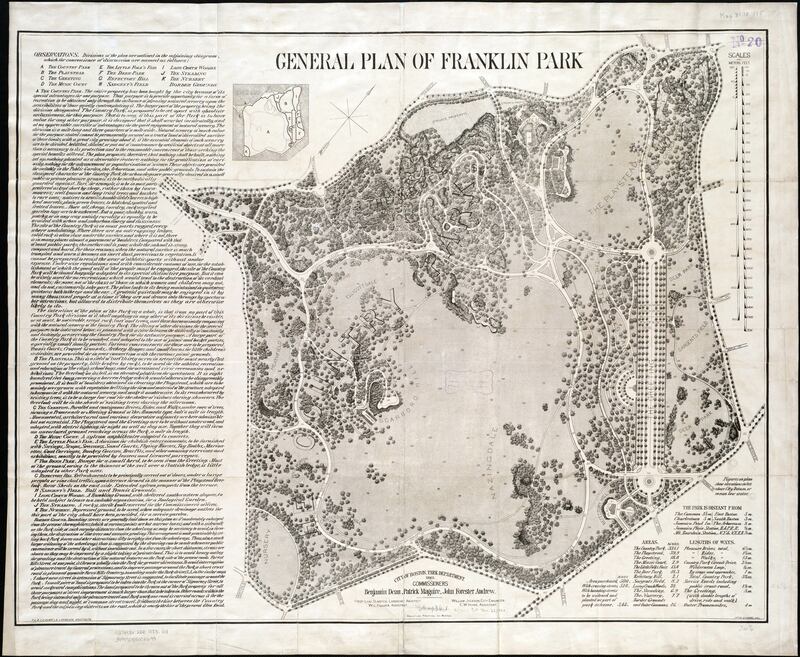 Looking at the map of Franklin Park, in the top right (NE) corner is Long Crouch Woods. This is where the abandoned bear cages can be found, and I was ending my day there when I noticed something. There is a path leading away from the bear cages that has long been fenced off, probably due to park maintenance of the roads, and I had never given it much thought. Yet today the fence was gone, the leaves were off the trees, and a fresh set of ski tracks in the snow led me down a little way to the Raccoon Cage! 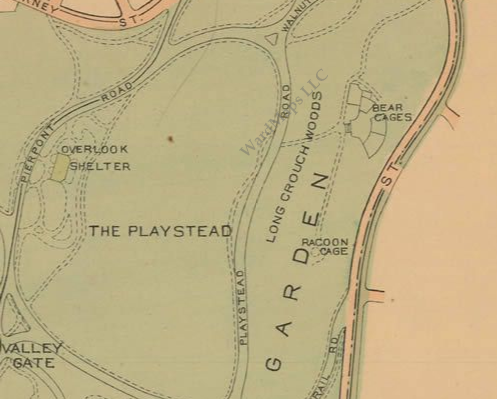 Detail of an early-20th Century map of the park, after the Zoological Gardens were completed, showing the location of the Raccoon Cage in Long Crouch Woods. 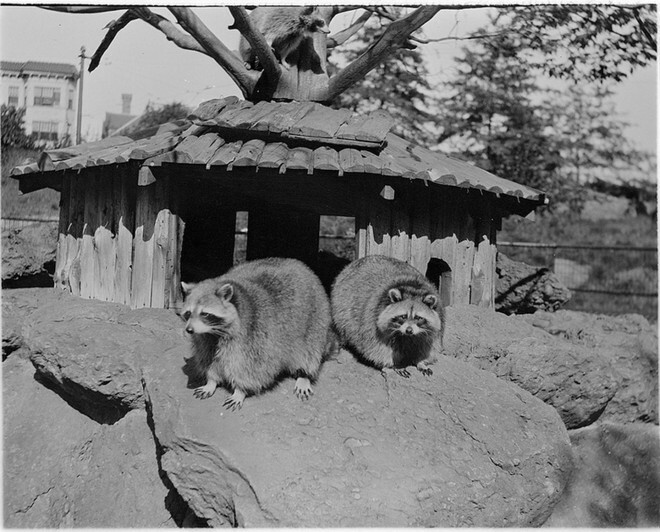 During my research I had found a map which showed the location of the Raccoon Cage, but I had assumed it was long gone. Very little of the original park structures are intact, and many are simply gone, removed to make way for improvements or upgrades. So I was quite surprised to find the cage intact and sitting, rather ominously, within sight of Seaver Street. What struck me about the Raccoon Cage was how brutal it seemed. 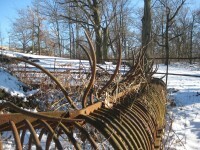 The nearby Bear Cages use the same wrought-iron spikes and heavy bars, but those cages are larger and more open, with trees inside and a sense of openness. I doubt the bears were overly comfortable, but at least two of the three bear cages don’t seem oppressive; the smaller cage set below the other two does feel a bit cramped. 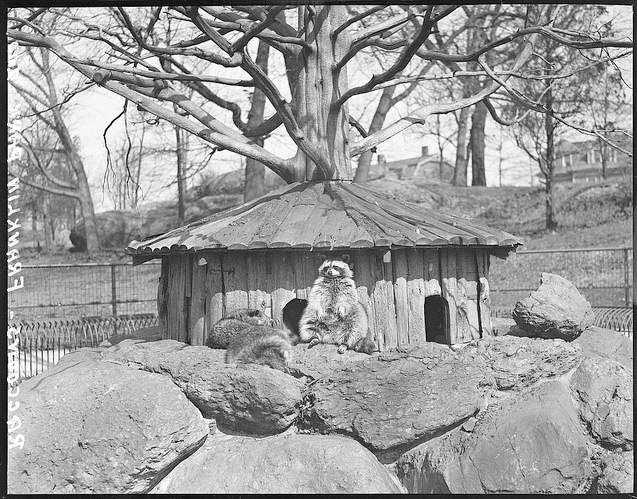 In contrast, the Raccoon Cage is a tiny pen with a rock in the center that, according to photos via the Boston Public Library, was topped with a wooden shelter. 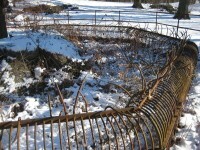 The rock is surrounded by a low trench and ringed with metal spikes curved downward, and then a fence for spectators. 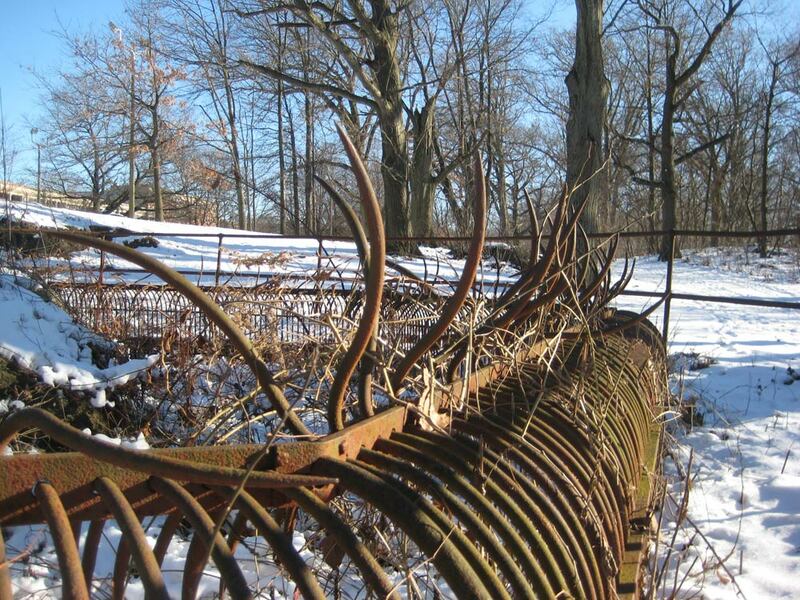 Olmsted wanted his country park to be used “exclusively with reference to the enjoyment of rural scenery” and it seems that the Raccoon Cage exists completely counter to that goal. 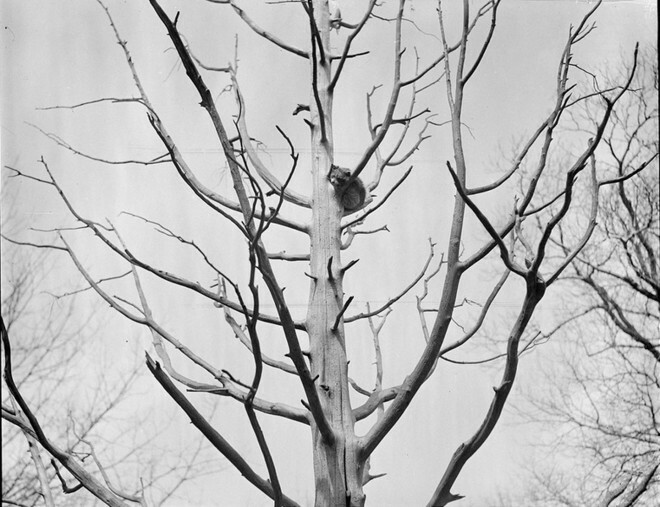 Rather than experience animals running free, climbing trees and being “natural” in any sense, here they are surrounded by aggressively man-made and visually startling constraints. Looking back toward the Bear Cages up the path that, for much of the past summer and autumn, has been closed. 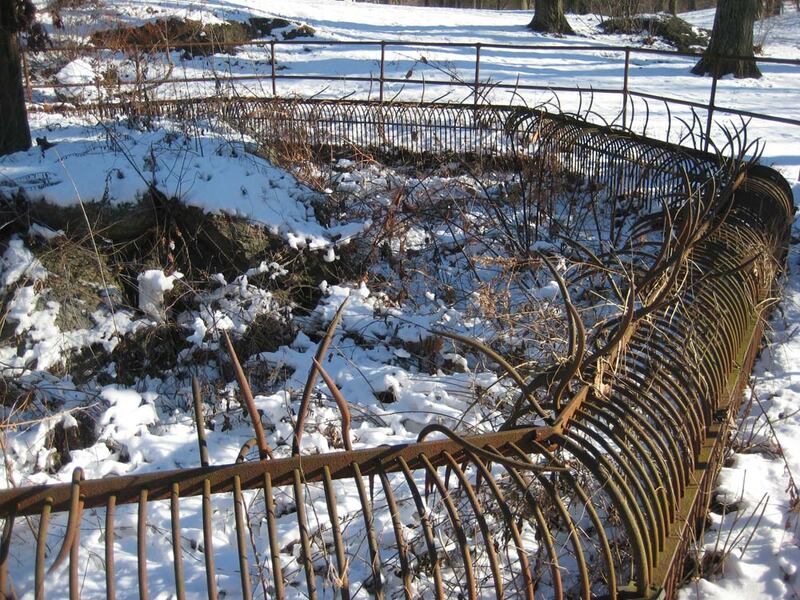 The iron work of the Raccoon Cage. 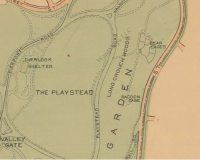 Now, several histories that I have read point out that the imposition of a zoological garden on the country park was not Olmsted’s doing, and was done by a city trying to justify park costs and bolster usage. 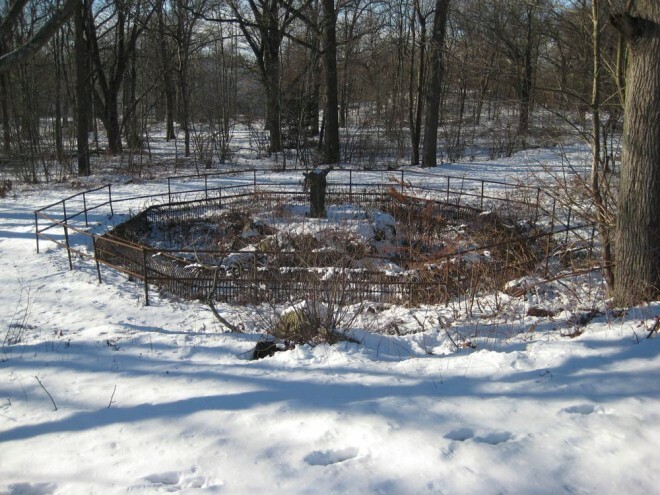 Olmsted’s son oversaw the addition of zoological features that replaced The Greeting portion that Olmsted planned with a more meandering zoo, extending to the Long Crouch Woods. 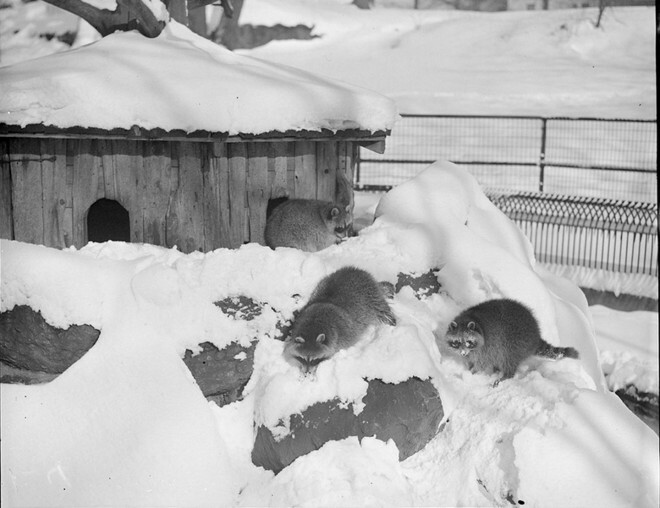 While only portions of this zoo remain (in ruins at the Bear Cages and Raccoon Cage, in use as the Birds World Expo) none of it was explicitly planned as part of the original or revised park plans. While Olmsted mentions Long Crouch Woods as “to be held subject to lease to a suitable organization, for a Zoological Garden” there is no plan for how the zoo would present its specimens. Many of the spikes have apparently been bent by vandals. Having found the Raccoon Cage at the end of my day, with both my video and still camera batteries dead, I’ll have to return soon. Yet I couldn’t help make this my first post about the strange ruins in Franklin Park, if only because after months of wandering it was great to be reminded of how much there is still left to see. I love that feeling of discovery, that sense of amazement when looking at a piece of history for the first time. 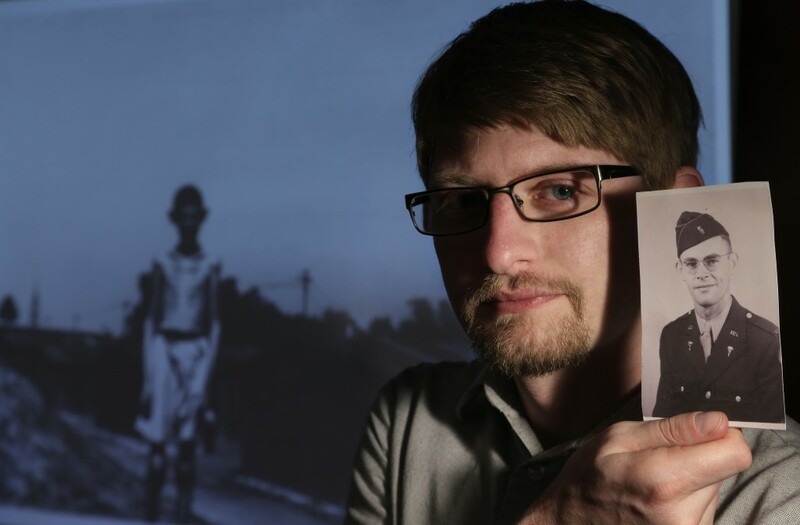 Sure, millions of other people have seen this site before me, but rather than diminish the moment I feel connected to their history and wonder even more about all that has happened on this site. The Raccoon Cage, viewed from the slight rise leading to Seaver Street. 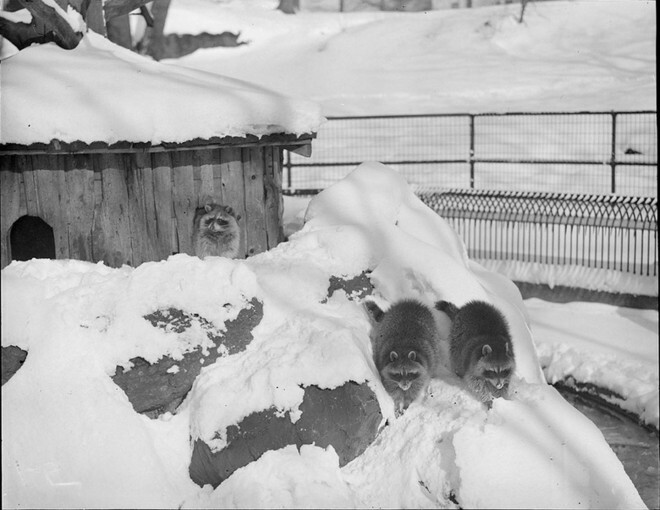 Poking around on Flickr, I found some more photos of the raccoons in their cage from 1932. I thought it worthwhile to add them here, since they show more of how the cage looked when it was part of the Zoo. Also, if you click on the pictures, you will be taken to the Boston Public Library’s Flickr stream, where the photo credits can be found along with lots of other great photos and history!